Last month, two children started a small fire with a lighter in a church in Escondido. Luckily, the fast response from local law enforcement and firefighters prevented and casualties and significant fire damage to the church. A few months before the church fire an Escondido home suffered from $500,000 in fire and smoke damage from a fire that spread from the garage into the home’s heating ducts. It took an estimated 33 firefighters from multiple districts to completely extinguish the house fire. Escondido sees its fair share of fires each year. In fact, fires can strike anyone at any time. According to the National Fire Prevention Association, an estimated 1.3 million fires break out in the United States each year. 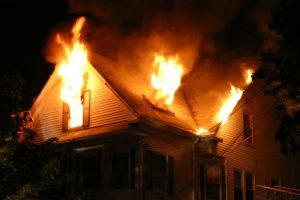 On average, there are over 3,000 deaths, 17,00 injuries and over 12 billion dollars in damages caused by house fires. These statistics show how important it is to follow fire prevention tips. One of the easiest and most effective ways you can help keep your family safe is to invest in smoke detectors and alarms. Installing these units throughout your home in the manufacturer’s recommended placements can mean the difference between life and death. You should have one smoke detector for each level of your Escondido home. Avoid placing your alarms near heating ducts, cold air returns, or above the stove – you end up with more false alarms this way. Airflow can also prevent the alarms from triggering. It is crucial that smoke detectors and alarms are checked on a regular basis. When you start to hear that annoying beeping noise that your smoke alarm makes when the batteries are low – replace the batteries. Don’t be that guy, you know the one that takes the batters out of the unit to get rid of the annoyance. Fires caused by candles, cooking, portable heating units, and other similar accidents can be easily prevented. Candles – When candles are lit do not leave the room before you put the candle out. With many of the items listed in this section, distraction and forgetfulness are big culprits in accidental fires. You may want to invest in a battery operated or electric candle to avoid any accidents involved in candles getting knocked over. Cooking – There are several fire damage risks when it comes to cooking. There are also several fire safety tips you can follow to prevent kitchen fire damage disasters. Remove any clutter from your stove or cooking area. Dish towels, wooden utensils, and loose clothing are highly flammable. Do not leave the stove unattended while cooking. Leaving the room to attend another task can lead to a forgotten pot of food boiling on the stove. As the water boils down the food starts to burn and can ignite causing a significant amount of smoke damage to your home. Avoid using any kitchen appliances that have frayed or damaged wiring. Electrical fires can be difficult to extinguish. Keep an eye on cooing temperatures when oil or grease is involved. If a grease fire does break out in your kitchen DO NOT use water to put out the flame. Attempt to remove all of the oxygen from the flame instead. Portable Heating Units – If you are using a portable heating unit make sure the unit is 3 feet away from any flammable surface. If you have children in your home, make sure the area around the heating unit is a “kid-free” zone. Don’t use portable heating units that have damaged or frayed wiring and when leaving a room make sure to turn the unit off. For all our efforts to prevent fires, sometimes they do happen and we are so thankful for our local law enforcement and fire department for their quick thinking and fast action. There are also 24/7 emergency restoration companies that will arrive on the scene to assess the damage and start a plan of recovery. In the Escondido area, you can rely on JNT Restoration for any fire or smoke damage cleanup and restoration needs.